Call: 07887 726901 or Email now! Sooner or later everyone needs help with their home PC or business computers and we are on hand to be there just when you need us. 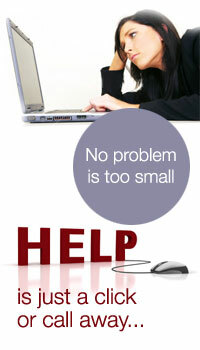 So don’t hesitate to call us for a speedy response no matter what your computer requirements are. for prompt advice and action. No fuss, no jargon – just a fast, friendly response with good advice in plain English. Our Microsoft Certified engineers will visit you in your home or office and carry-out the necessary upgrades and repairs to get your computer working properly again. No problem is too small and with no call-out charge, you can be guaranteed of a friendly, reliable service.